On the culminating event on the last day of their UK visit, they presented their thoughts and findings, and opened to the public a mural documenting their experience. The most interesting aspect of what they presented was their reflection on how they will bring everything they learned back home to Saudi Arabia. The expedition, led by the UK-based artistic exchange organization Off Screen and their Saudi-focused project Edge of Arabia and initiated by the Saudi Arabian General Investment Authority (SAGIA), aims toward a few pertinent and broad-minded goals. Among them is referring to the education gap in Saudi Arabia regarding the arts, rethinking the gender roles that are preconceived about the creative realm and teaching individuals about the impact of creativity on society. This promising partnership between Off Screen and SAGIA has successfully extended a web of knowledge. “I feel I have a responsibility to pass my inspiration and what I have learned to other Saudis at home,” explained participant Adwa Al Mubarak. Saudi Arabia, like any country in the world, has thriving creative circles. However, at the moment, there are restrictions from allowing them to develop. 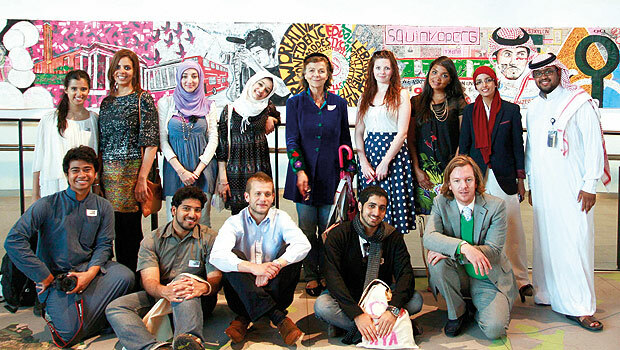 The ten winners of the Create & Inspire competition were filmmakers, photographers, graphic designers, painters and more. And, beyond them were the other 500 who applied with their own creative pursuits and supportive families, explained Maryam Bilal from the Edge of Arabia Jeddah office. So, this is not to say that the Saudi youth have been stinted by any lack of conventional platforms, but quite the opposite. Just as in anything, when there is a lack of available outlets, people in need will create their own. Participant Hussein Ismail pointed out young people’s use of social media to share their creativity. He said that sites like Facebook and Flickr have been vital at taking their works to further reach, and pointed out that You Tube, has most of its uploads coming from Saudi Arabia. Innovation has been a big part of how young creative talents in Saudi Arabia work — in their exhibiting methods, as well as their self-led education on technique and theory. But, still, there is work to be done, as art is still considered a “ladies” activity, one of leisure and not respectable for men. Clearly, this presents a problem for creative men and for creativity in general. This mindset sidesteps the role creativity and the arts plays in social organization, intellectual development and general well being. The opening event allowed the ten participants to share their English experiences and look at the differences between what they are accustomed to in Saudi Arabia and what they saw in the UK. Following the example of Abdulnasser Gharem, an artist and one of the co-founders of Edge of Arabia, the participants were encouraged to think individually, interpret current affairs and reflect on social issues. They took this a step further, attempting to learn from the outside in just as well. “We learned a lot about ourselves and our learning processes, but also about our country through the way people we met see Saudi Arabia from the outside,” explained participant Ahaad Al Amoudi. Among the activities they partook in was investigating, by randomly chatting with people on the streets, how people in England see Saudi Arabia. Looking for one-word answers, the participants took stereotypes as among the first notions they would like to tackle through their work. All this was ultimately documented in the mural made by the participants, which now hangs in London’s City Hall. The mural, a collage of their combined experiences, is made up of newspaper clippings, drawings and photographs with notes on what they hope for the future. “Hope for cinemas in KSA soon,” read one, while another remembered the pleasure of sitting on grass and appreciating nature, as opposed to the concrete of Saudi cities. The mural also communicated their ideas on the positive and negative aspects of how people view Saudi Arabia from England. However, mostly, it was the inspiration to look at the future, be independent and break from the socially regulated perceptions that were most prominent. The “inspire” part of the Create & Inspire title is what ultimately shone through. The participants were beaming with pride and excitement at what they had picked up during their two weeks in the UK. The greatest point there was, once again, was the way the students were looking to sharing their knowledge once they return home. But, this trip seemed to do even more than that, as many of them are walking away with practical plans as to what they will do next in their artistic pursuits. This includes researching a way to set up creative hubs to house discussions in their respective cities and going into higher education that focuses on the arts. In her closing statement, Kim Pringle, head of competitiveness initiative at SAGIA, explained that with the aim of developing creativity in Saudi societies, she hopes that these young voices, like those leading today’s reform through the Arab world, will be those that will develop their creativity and expression to work with governments toward improving society. This is only the first year for Create & Inspire. The next competition is expected to be announced in coming months. In the meantime, a plan to invite participants from the UK to Saudi Arabia is also in the works.